While the largest city in Scandinavia, Copenhagen maintains a provincial atmosphere that is instantly appealing. The city is dominated by delicate spires rather than hulking skyscrapers, and the influence of the sea and canals are reflected in its name, a deviation of “merchants’ harbour”. Favorite restaurant: La Crevette, Tivoli, tel: +45 33 14 68 47. 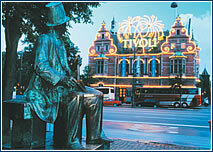 Or any other restaurant in Tivoli. Advice: Rent a bicycle for DKK 20 parked on many different standpoints and have a ride across Copenhagen. Later you can returned it anywhere and get your DKK 20 back. Advice: Beware of the prices of beer in the city center – you can pay even DKK 60 for a glass of beer. Favorite night club: Nyhavn in summertime. 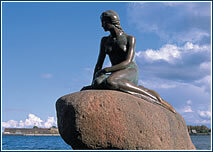 Favorite attraction: All of Copenhagen for its relaxed atmosphere, especially the Tivoli park and sea-cruises. Best-kept secret: Restaurace Det Lille Apotek, Store Kannikestraede (takovy ae) 15, tel: +45 33 12 56 60. I can recommend the Peter Faber lunch. Favorite shops: Magasin du Nord, Kongens Nytor V 12, in the center of Copenhagen. W.O. Larsen, Amager Torv 9, tel: + 45 33 12 20 50. Denmark is the ideal country for pipe-fanciers. You can buy good tobacco in this shop. They will mix a blend according to your tastes, and you can visit a small pipe museum. Advice: Count on very high prices compared to Germany, for example. The airport shops offer additional 20% discounts for non-EU citizens traveling home. Favorite shop: Kodaňské letiště – nejlepší výběr v Evropě.Copenhagen Airport – best selection in Europe. Best-kept secret: Use the time in the airport to get a good deal. Advice: Never take a taxi from the airport if you can avoid it. The train is good value for money. Basic factsLocation: Hessen, central Germany. Ethnic mix: 91.6% white, 8.4% other. Religion: 35.7% Protestants, 34.7% Catholics, 2.2% Muslims, 27.4% other or no religion. For further information, we suggest the following websites dedicated to Copenhagen: http://www.lonelyplanet.com/destinations/europe/copenhagen/ -a well-rounded site for tips that cover everything from dining to DJs. http://businesstravel.about.com/cs/cityinfoeurope/ -an excellent jumping-off portal site that provides links to more specialized pages. http://www.bugbog.com/european_cities/copenhagen_travel.html – Kumuka Expeditions offers this site that centers around their own tour itinerary. http://www.fodors.com/min…………….ion=copenhagen@52 – this online city guide from the fine folks at Fodors is useful primarily for leisure info. -a portal page featuring WAP sites that have information on various European cities. http://www.aok.dk/Copenhagen/- Visiting_Copenhagen/ – a sort of timely “insider’s guide” to what’s happening in the city..
· Copenhagen’s role as a traditional north European transport and trade hub has been strengthened by the economic rise of the Baltic States of Estonia, Lithuania and Latvia, as well as by the democratization of eastern Europe. · Denmark’s strong economy is characterized by a balanced state budget, low interest rates, low inflation and a stable currency. The IMD/World Economic Forum consistently votes the Danes as best workforce in Europe. Greater Copenhagen is home to 29% of companies registered in Denmark and these companies account for 45% of total domestic sales and 48% of national exports. 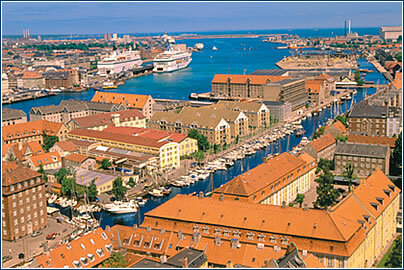 The city also attracts 60% of all direct foreign investment in Denmark, 80% of which is in the service sector. · The 980,000-strong workforce in the Greater Copenhagen region tends to be well educated, computer literate and multi-lingual. Copenhagen’s business strengths lie particularly in energy, design, information technology, biotechnological and medical research, telecommunications, environmental technology and tourism. A recent PricewaterhouseCoopers study cited the city as the most favorable place in northern Europe to establish an e-business center. · Punctuality for appointments is essential, and the dress code is relatively formal. Business contacts should shake hands on arrival and departure with business cards exchanged after introduction. Most Danes in the international business community speak excellent English and often speak German and French as well. · Business visitors are well looked after, with the provision of lunch, taxis and accommodation. Nearly all meetings are non-smoking venues but it is not inappropriate for moderate alcohol consumption over a business lunch or dinner.